Cut fresh, all day every day! The potato is no less than one of the world’s most versatile vegetables! Yellow Finnish Yukon Gold are locally grown and cut fresh in our kitchen . 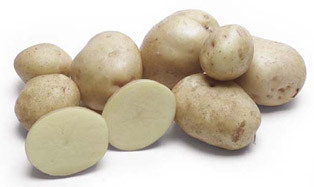 Yukon Gold Potatoes are medium-sized round potatoes with delicate yellow-colored skins. Their excellent creamy texture is a natural yellow giving them a rich subtle "buttery" flavor. Yukon Gold Potatoes are used for our fries, spiral potato, curly fries, and poutine. To preserve the nutrients, we leave the skin on. Serving Size 1 medium (148g). Yams are known by many names including boniato, njam, nyami, djambi, yamswurzel, ñame, and igname de chine. We use delicious yams for our yam fries. MMMM so good. dip sauce made from Roasted Garlic & Chili Aioli. Our sugarcane clamshells are an excellent choice for the environmentally conscious wanting to make a difference. During sugarcane processing the juice is extracted to make sugar and what remains is raw fibre called bagasse. Bagasse fibre is a byproduct from the process that would otherwise be discarded or burned. Not only are these clamshells made from recovered and abundant waste fibre, but they are 100% biodegradable and compostable. Since they are compostable, consider diverting waste from landfills by composting your used clamshells. Our clamshells are strong, durable and work well for most all foods, hot or cold. Handles temperatures up to 93° C or 200° F.
If you are looking for environmentally friendly cutlery that works, then give ours a try. Sturdy, functional and 100% compostable, our cutlery is made from 70% non-GMO PLA and 30% talc. Our cutlery is also heat resistant up to 200 degree Fahrenheit. Note that composting is required for biodegradation. Our cutlery will biodegrade in 180 days in a commercial composting facility however due to higher heat requirements, home composting is not recommended. Buyer beware! Many "green" cutlery options on the market today contain traditional petroleum based plastic like polypropylene and are not compostable.